Ever since indulging myself in the world of beauty, blogging and youtube, it's occurred to me that people have the most extravagant, in depth morning and evening routines I think I've ever seen. And I mean, that's great if it works for you, and I wish I had the patience to create one of my own, but truthfully I just enjoy the simplicity of a few staple products to set me up for the day ahead. My skincare routine is pathetically little in comparison to other ladies and gents' that I've seen, yet, it does the job and my skin seems to be doing just fine. The first thing I do when I wake up is wash and cleanse my face, at the moment I've been trialling the Emma Hardie Moringa Cleansing Balm and so far so good; I'm not fussy when it comes to cleansing, as long as my makeup gets removed and my face feels clear - I'm happy. 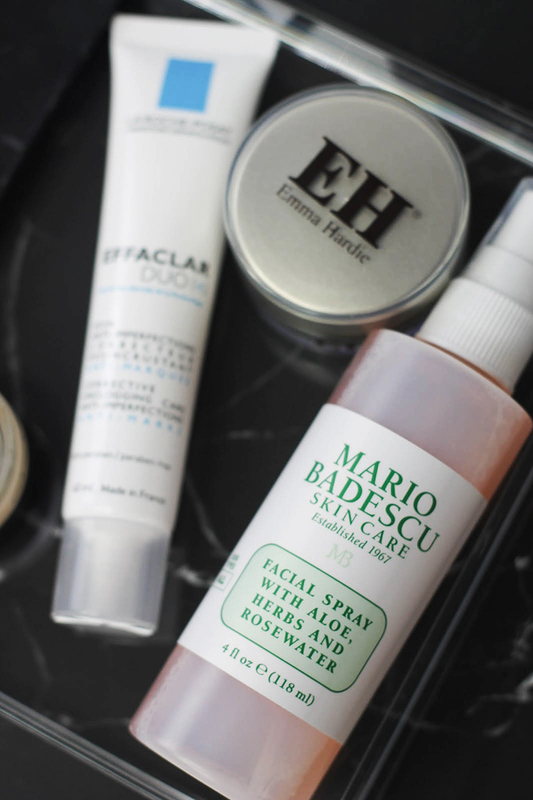 Afterwards, I pat my face dry and go straight in with the Mario Badescu Rose Water Spray for an extra boost of refreshment. This works wonders at injecting moisture into the skin, and is a great preparation for makeup - plus, it's so affordable. And last but never least, the La Roche-Posay Effeclar Duo+, I use this as a two-for-one product as both a serum and a moisturiser, it truly does what it says on the tin and clears up any redness, blemishes and general discolouration. I love this stuff! On a day to day basis, I keep my makeup extremely minimal, sometimes I'll throw in a bright lip colour but essentially the rest is pretty basic. Silly me forgot to photograph my concealer, doh! However I use the Collection Lasting Perfection concealer under my eyes and over any blemishes I may have. My staple product for any makeup look is my Anastasia Beverly Hills Contour Kit, the three contour shades are perfect for both bronzing and sculpting with the swipe of a brush, it makes shaping and bringing life to the face so much easier. I add a pop of colour to the apples of the cheeks in the form of the Natural Collection Blushers, I own every shade of these as they're so cheap and cheerful, and I tend to switch my shade up on the regular. For the brows (my favourite part, eek!) I use the Anastasia Brow Definer, I've done a post on this brow pencil here if you want to see it in all its finery, but I've never had such a quick brow routine until this little baby came into my life. Brow goals have never been so easy to achieve! I finish my brows off with a coat of the Collection Clear Mascara, it costs a mere £1.99 I believe and it's an incredible brow gel, the hold is superior to higher end gels I've tried - and that's saying something. Finally, I love to use the MAC Paint Pot in Soft Ochre to neutralise my eyelids and blank out any discolouration or not-so-nice veins that tend to be visible on my more tired days. This instantly lifts and brightens the eyes, I always find I look way more awake when I use this, and it's a great base for eyeshadow too. 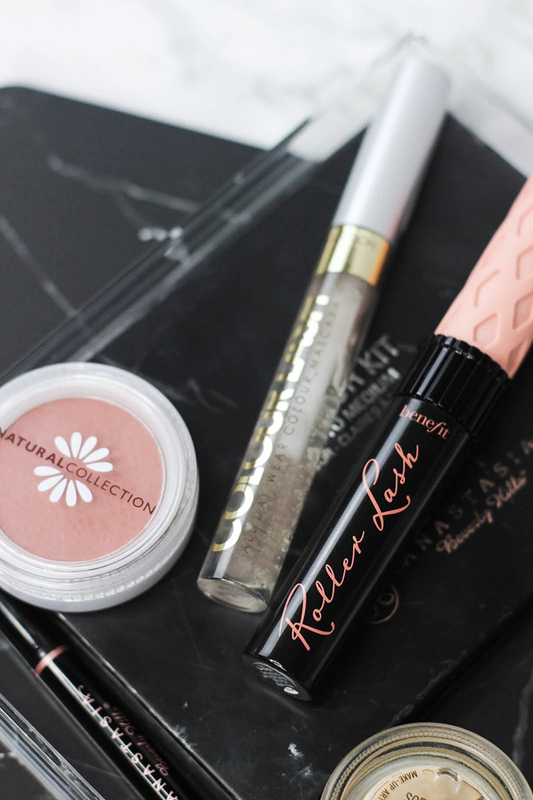 I finish the daytime look off with the Benefit Roller Lash Mascara, this works wonders at lengthening the lashes whilst creating and holding a curl, you can say goodbye to those eyelash curlers! And that's everything, my actual, realistic morning routine for anybody who's interested. It's simple, minimal and yet still leaves me feeling confident and put together. And the beauty of it? 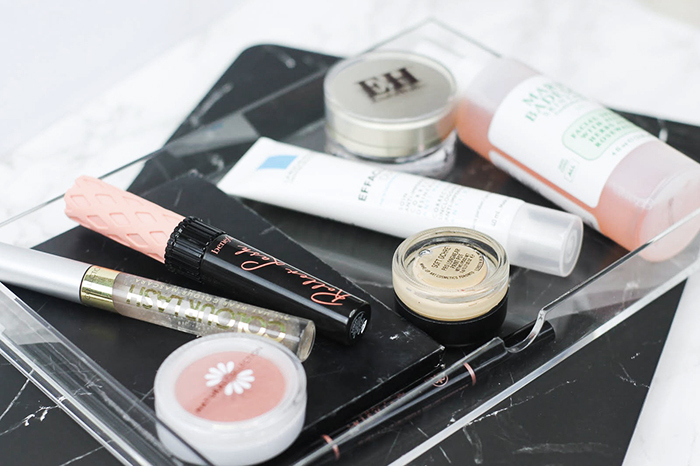 You can always add or take away to your preference, that's the brilliance of makeup! What's involved in your morning routine? I'd love to know, comment below!